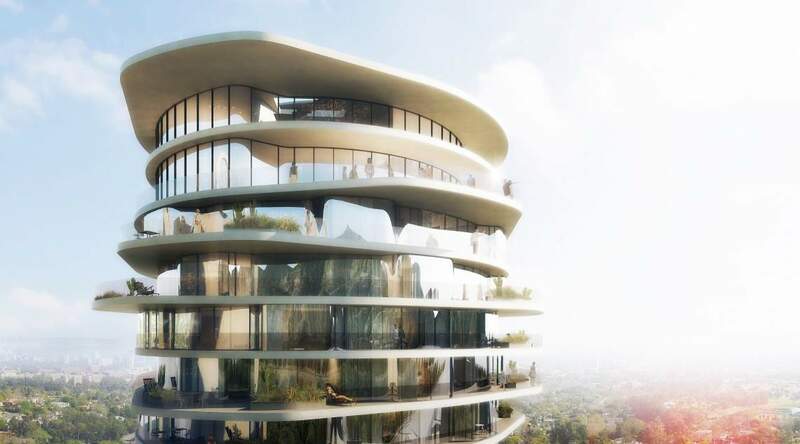 According to recently-submitted documentation, a sinuous hotel tower designed by Culver City–based R&A Design slated for the Sunset Strip in West Hollywood, California is one step closer to coming to fruition. Developer Charles Company recently submitted the project—located at 9034 Sunset Boulevard—for approval by the City of West Hollywood. If built as planned, the 19-story tower-and-podium complex will include 185 hotel rooms, 17,000 square feet of hotel-related banquet and event spaces, 5,700-square feet of retail space, a 7,500-square-foot restaurant, and a 915-square-foot art gallery. The project also calls for 550 parking stalls to be located in a four-story underground parking garage. The project would also include 14 apartment units and a helipad on its roof, Wehoville reports. The so-called Sunset Tower project is set back from the street and is located on a 1.3-acre T-shaped lot. The tower portion of the project features curved and rotating floor plates that project beyond the building envelope to create outdoor spaces as the floors rise and shift in position. Renderings for the project also depict the tower’s upper levels with much taller floor-to-floor heights, indicating that those levels will likely contain public spaces. The project’s retail and restaurant uses will be organized within a three-story podium structure that will meet the sidewalk. The podium structure is depicting as having a rooftop pool and other amenity spaces. The hotel tower complex comes as the West Hollywood area continues to add sizable numbers of new hotel complexes on and around Sunset Boulevard. Neil M. Denari Architects recently proposed a 91-unit hotel for a nearby site that features black metal panel cladding. A hugely controversial hotel tower project by Gehry Partners is slated for 8150 Sunset Boulevard and has been held up with lawsuits and community outcry for its height as well as the developer’s plans to tear down an iconic mid-century modern bank that currently occupies the site. A timeline for approval of the Sunset Tower project has not been announced. 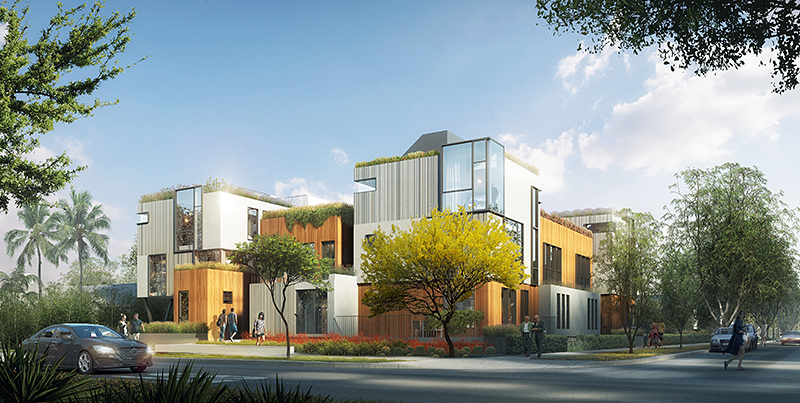 The West Hollywood Planning Commission (WHPC) has approved a small-scale, 11-unit apartment building designed by Culver City-based R&A Architecture+Design. The project is designed as an intimate courtyard apartment complex, with a series of two- and three-bedroom units organized around a central, shared open space. The dispersed masses of the complex are clad in a variety of surface materials, including corrugated sheets of aluminum, vertically-oriented wood siding, and expanses of glass. The more solid sections of the building are studded with punched openings that signal windows, doorways, and passageways into the courtyard in a manner that corresponds to the surrounding low-level density of the neighborhood. Units in the project average 1,585-square feet in size, according to a press release, and are connected to various types of outdoor spaces, including rooftop gardens and balconies. The project is designed to facilitate natural cross-ventilation via the courtyard, exterior staircases, and unit doors that are clad in louvers and screens. The units are also designed with concrete floors throughout that will act as thermal massing for each home. Christian Robert, principal at R&A explained the contextual massing of the project in a press release, saying, “(the) segmented massing respects the scale of nearby homes. As architects, we thoughtfully pay attention to the context and work to maintain the community spirit.” The intense contextual focus of the project is no mistake on the part of the designers, as the project comes on the heels of several controversial developments in the city, like the Gehry Associates-designed 8150 Sunset project. Recent, density-oriented projects have rankled locals in the densifying municipality and across the Los Angeles region. Los Angeles voters recently defeated a controversial and anti-development measure that sought to curb new housing production in the city, but a weariness toward dense development has taken root nonetheless. Construction on the R&A Design project is scheduled to begin spring 2018.